This article aims to explain what exactly is the .KRAB files virus and then help victims to remove the ransomware and potentially restore encrypted files. 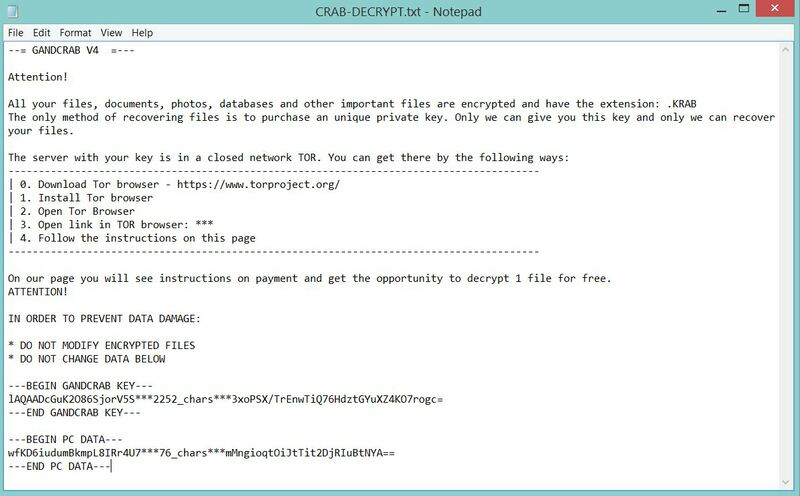 The .KRAB files virus is a new version of GandCrab data locker ransomware. The threat has recently been released in active attack campaigns against computer users worldwide. Its name is a derivative of the specific file extension .KRAB placed at the end of all corrupted files. 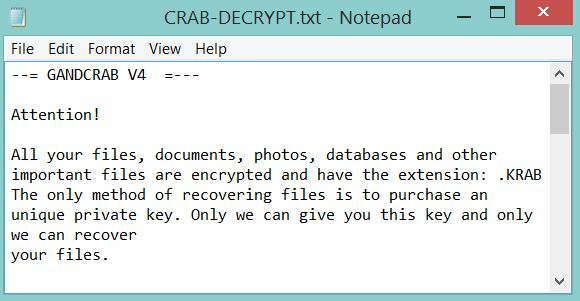 Following encryption, this new GANDCRAB V4 drops a ransom note to instruct victims how to pay for the unique decryption key that will recover .KRAB files. By reaching the end of the article, you will know how to remove the threat and find some alternative data recovery methods that may help you to restore .KRAB files without paying the ransom. Short Description Version 4 of GandCrab ransom virus family. It encrypts your files and asks you to pay a ransom for unique recovery key. Symptoms Encrypted files are renamed with the extension .KRAB. They remain unusable until an efficient recovery solution is used. A ransom note, named KRAB-DECRYPT.txt is dropped on your PC. User Experience Join Our Forum to Discuss .KRAB Files Virus. 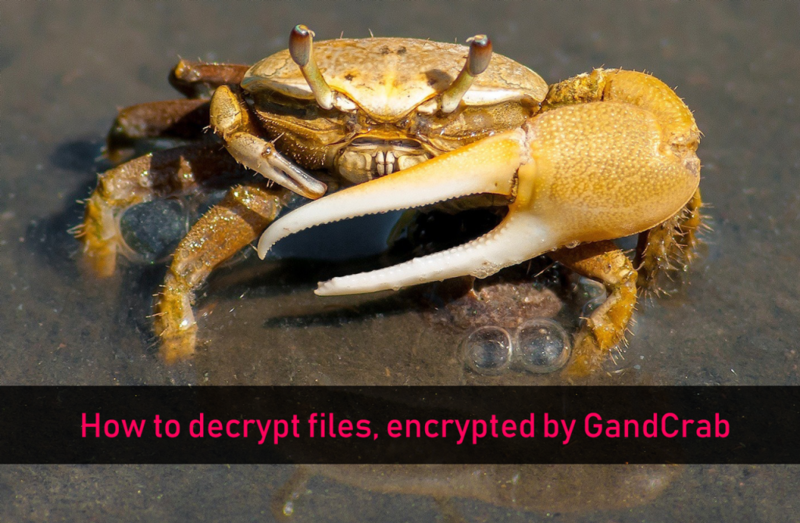 how to decrypt files encrypted by GandCrab ransomware for free. If more languages are being added, either the cybercriminals are going to spread their malware in more countries (by using malvertising campaigns, for example) or they know that those countries are already affected by the .KRAB Files Virus. .KRAB Files Virus – How Does It Infect? A tip that could help you to improve your online security and keep devastating malware infections like GANDCRAB V4 away from your PC is to use free online file extractor before you open a dubious file on your PC. Such tool will scan the code of the uploaded file and check its security level. After, the scan you could see whether the uploaded file is a potentially harmful one. The details about the file will help you to refrain from opening it on your PC. New version of the notorious GandCrab ransomware has been spotted in the wild. This is acutally the fifth version of the threat after GandCrab, GandCrab v2, GANDCRAB V2.1, and GandCrab 3. However, hackers present the last iteration of their ransomware as GANDCRAB V4. The infection process begins at the moment when the payload is started on a target computer system. Immediately after this happens the payload is likely to drop and execute additional malicious files needed for the completion of the attack. In order to evade detection .KRAB crypto virus may drop files that resemble legitimate system processes. These files are designed to perform various system modifications that plague essential settings and enable the ransomware to obtain persistent presence. In case of infection with .KRAB virus some registry sub-keys including but not limited to Run and RunOnce may be plagued the ransomware. By exploiting the functionalities of these two registry keys the threat becomes able to run its malicious files on each system start. Threat actors do not specify the amount of the demanded ransom but it is likely that they will want the transfer in cryptocurrency. For the previous GandCrab versions it is known that hackers demand an amount of $500 in DASH cryptocurrency in exchange for the decryption key. 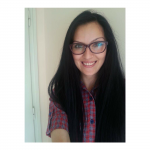 What we could advise you is to refrain from paying the ransom until you try all existing alternative data recovery methods that are believed to help you to restore a few to all of the encrypted .KRAB files. 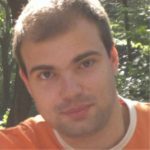 Similar to the previous GandCrab ransomware iterations this one plagues computer systems with the main purpose to locate predefined target types of files and encrypt them with the help of Salsa20 stream cipher algorithm. This process transforms all files that store sensitive information in a way that you cannot use them anymore. After encryption, all corrupted files could be recognized by the extension .KRAB appended at the end of their names. Then the above-stated command is executed one of the prominent ways to restore your data is eliminated. If a computer device was infected with this ransomware and your files are locked, read on through to find out how you could potentially restore some files back to their normal state. The removal of .KRAB files virus demands a bit of technical experience and ability to recognize malware traits. Meanwhile there is no doubt that you should remove this nasty ransomware from the infected PC as soon as you detect it. Don’t wait until it’s too late. The threat may take the chance to spread its infection files across the whole network. Below you could find how to remove it step by step. Beware that ransomware is a threat with highly complex code that is designed to plague not only your files but your whole system. So as recommended by security researchers you need to utilize an advanced anti-malware tool in case that you want to be sure that it’s gone forever. Furthermore, such tool will keep your system protected against devastating threats like GANDCRAB V4 and other kinds of malware that endanger your online security. After the removal phase, you can proceed to the second phase which aims to show you some of the existing alternative data recovery approaches that may help you to restore a few to all of the encrypted .KRAB files. Threats such as .KRAB Files Virus may be persistent. They tend to re-appear if not fully deleted. A malware removal tool like Combo Cleaner will help you to remove malicious programs, saving you the time and the struggle of tracking down numerous malicious files. Threats such as .KRAB Files Virus may be persistent on your system. They tend to re-appear if not fully deleted. A malware removal tool like SpyHunter will help you to remove malicious programs, saving you the time and the struggle of tracking down numerous malicious files. Note! Your computer system may be affected by .KRAB Files Virus and other threats. SpyHunter is a powerful malware removal tool designed to help users with in-depth system security analysis, detection and removal of threats such as .KRAB Files Virus. 1. Install SpyHunter to scan for .KRAB Files Virus and remove them. 2. Scan with SpyHunter, Detect and Remove .KRAB Files Virus. Ransomware infections and .KRAB Files Virus aim to encrypt your files using an encryption algorithm which may be very difficult to decrypt. This is why we have suggested several alternative methods that may help you go around direct decryption and try to restore your files. Bear in mind that these methods may not be 100% effective but may also help you a little or a lot in different situations. Note! Your computer system may be affected by .KRAB Files Virus or other threats. Remove .KRAB Files Virus by cleaning your Browser and Registry. Fix registry entries created by .KRAB Files Virus on your PC. Combo Cleaner is a powerful malware removal tool designed to help users with in-depth system security analysis, detection and removal of threats such as .KRAB Files Virus. Step 5: In the Applications menu, look for any suspicious app or an app with a name, similar or identical to .KRAB Files Virus. If you find it, right-click on the app and select “Move to Trash”. Step 6: Select Accounts, after which click on the Login Items preference. Your Mac will then show you a list of items that start automatically when you log in. Look for any suspicious apps identical or similar to .KRAB Files Virus. Check the app you want to stop from running automatically and then select on the Minus (“–“) icon to hide it. Remove .KRAB Files Virus – related extensions from your Mac’s browsers. A pop-up window will appear asking for confirmation to uninstall the extension. Select ‘Uninstall’ again, and the .KRAB Files Virus will be removed. When you are facing problems on your Mac as a result of unwanted scripts and programs such as .KRAB Files Virus, the recommended way of eliminating the threat is by using an anti-malware program. Combo Cleaner offers advanced security features along with other modules that will improve your Mac’s security and protect it in the future. How do I completely restore my .KRAB extension files to normal stage?.very urgent.. reply me as soon as possible..
Gandcrab ransomware is a threat with very complex code. At this point, there is no evidence of successful attempts of security experts to crack its code. So you could only attempt to use the help of alternative data recovery methods that may restore some of your .KRAB files. Check them out in step two “Restore files encrypted by .KRAB Files Virus” listed in the removal above. I’m running the decrypt software but it’s just stuck at looking for decryption key. We have been hit with the krab ransomware. Files are encrypted with a .krab extension. Please help. Currently, only alternative data recovery approaches provide chances for the restore of .KRAB files. You could find some of them in the guide above. However, keep in mind that they do not guarantee maximum efficiency. Krab Files – are you able to assist? For now, all that we could do is to suggest checking the content revealed in the “restore .KRAB files” step listed in our guide. Perhaps some of the methods described there may be effective to some extent. Unfortunately, there is no available free decryption solution for Gandcrab ransomware. The moment we spot one we will make an update of our article with a download link for it. For now, we could advise you to consider the use of alternative data recovery approaches some of which are listed in our removal guide. What you should know is that they do not guarantee maximum efficiency for .KRAB files recovery process. I am very confused to return the data that has been encrypted by this #grandcrab. Hopefully, the computer experts will immediately release the decryptor. But we have to run with time for data and cannot be silent. What recovery software can restore this encrypted data, please tell me. is there way to decrypt KRAB encrypted files ? I don’t think bitdefender Decryption tool is working ! I ran it a couple of times but it can’t seem to decrypt the file. recovery software only recovered same file with .krab, .crab extension. as eg xxxxx.xls.Crab I need file with .xls only. how can I remove the second extension?? Hey man look, i got gandcrab and i wiped my computer, i kept no old files. After that process i ran the spplication just to make sure that it was gone and it said i was safe but the thing is, in my recovery drive, i saw the gandcrab txt file, does this mean tyat the malware is still on my device but its just hidden? Another thing is my factory reset only got to 48% froze for 3 hours then i turned my computer on and off and it said all personal files were deleted but not everything, and although the scan said i was good, i dont know if because the txt file was in my revovery drive i still have gandcrab. Hey !, I found this information for you: ".KRAB Files Virus – How to Remove GANDCRAB V4 and Restore Data". Here is the website link: https://sensorstechforum.com/krab-virus-gandcrab-v4-remove-restore/. Thank you.